Water surrounding basements is the number one cause of foundation failure in North America. This water causes settlement, bowing walls, and cracked walls and slabs. Exterior drainage systems are not waterproofing, they are a water management system. How does it do it? When a foundation is dug out, it is dug slightly bigger than what the house will be so that the workers have space to get in and put things in place. However, this leaves empty spaces beside the home that need to be “backfilled.” This backfill is looser and not compacted like the untouched soil underneath the home. Water can easily make its way through the soil, which will become denser and begin to push against the sides of the foundation. This is called hydrostatic pressure, and it can cause damage like bowing walls, cracks, structural problems, and even problems on the upper floors due to foundation damage below. 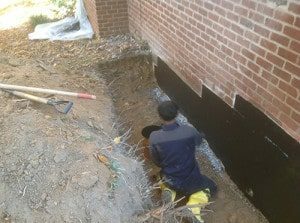 The first step before an exterior drainage system is foundation repair of the issue which may include underpinning options like helical piers, push piers, or wall anchors. Next, we will move on to managing the waterproofing issues. 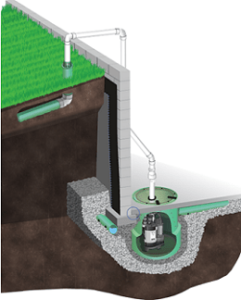 Interior drain systems, or interior water diversion systems, take water away from the foundation and direct it to the sump pit so that it can be discharged outside the home. Many times the cracks in your basement floor have been caused by trapped water that is rising and needs a place to go. An interior drainage system that is placed next to the footing, not on top of the footing, takes this water and channels it to the sump pit where it can no longer cause problems. Remember, this is not waterproofing but water management. You are not stopping the water problem at the source, you are re-directing it so that it is no longer a nuisance. Whether you want to remodel your basement or you have a finished basement that is damp interior water control systems give you the peace of mind that trapped water now has a place to go, without ruining your new living space. Basement water control is not something that only must be done to homes with major water leaks and flooding, but should be done in every home that is using this area as living space. They help eliminate odors, mold and mildew and that unpleasant basement smell.